For the last month it’s been my great pleasure to support incredible writer/facilitators, François Matarasso and Sabrina Mei Smith – in the delivery of this Writing East Midlands led and Leicestershire Partnership NHS Trust partnered and supported project. Here’s a piece about it by internationally acclaimed participatory artist, François Matarasso. We’ll be launching a book arising from this first phase of Leicester’s Elder Tree in early June – with further residencies and activity to follow across Leicestershire Partnership NHS Trust and University Hospitals Leicester, later this year. For several weeks, I’ve been facilitating creative writing workshops in Leicester. The project, commissioned by Writing East Midlands with the local NHS Trust, is for elders, here meaning people aged over 55, a category that includes me. We don’t have very long—five ‘taster sessions’ with community groups, and ten two-hour workshops. At the beginning of a project, I really don’t know where I’m going. So much depends on who else comes along, what they contribute and where they want to go. The uncertainty is more exciting than frightening, but there is always an edge; I would worry if I didn’t feel it. I remember sitting in the car for a long time, one dove-grey January morning, feeling the edge and trying to marshal my resources before meeting the first group. I can’t now remember what exercise I’d planned for us to do because we never got that far. 3 The Hard Way – Part 2: On Englishness and Finale Touring. For the last month I’ve been UK touring, Three the Hard Way – Part 2: a brand new show featuring Jean Binta Breeze, Shruti Chauhan and I, 3 women of 3 continents and 3 generations. Part 2 is of course the second part of a show that Jean and I first embarked on in 2014, with Shruti joining us this time around; it’s hard to overstate the progress we’ve all made together, in terms of both the show’s increased experimentation and the conversation our different backgrounds have allowed us to have. One of the joys of the 3 The Hard Way format is the way in which it has allowed us to adapt and develop our approach and material in response to each others’, the space and ongoing contemporary events as we’ve toured. In this way, no two shows have been the same and the process of listening to each other and audiences have allowed the work to shift and develop in some very interesting directions. From round table rehearsals, where we’ve sat over tea and pakora answering poetry with poetry…to long distance car journeys coming back from shows, reflecting and unfolding new ideas stimulated by each others’ experience and the evening and audience met. One personal outcome has been the creation of a new piece, on the subject of Englishness – a tricky subject I feel I’ve been building up to approach for a number of years but which the Three the Hard Way process has finally helped me write. Beginning to read around the subject, starting with Simon Featherstone’s excellent, ‘Englishness’ – recommended to me by Ms Breeze, I’m looking forward to deepening my research and thinking, in the context of my broader experience and in ongoing, lucky conversation with Jean and Shruti. The work unpacked by both throughout our tour has been inspiring to say the least. This latest piece, produced as a result of all the above, debuted in Birmingham at the excellent Drum a couple of nights ago. It had it’s second outing last night in Northampton and I’ll be doing it for the last time – as part of this particular tour – this Monday in Loughborough at our finale tour date. 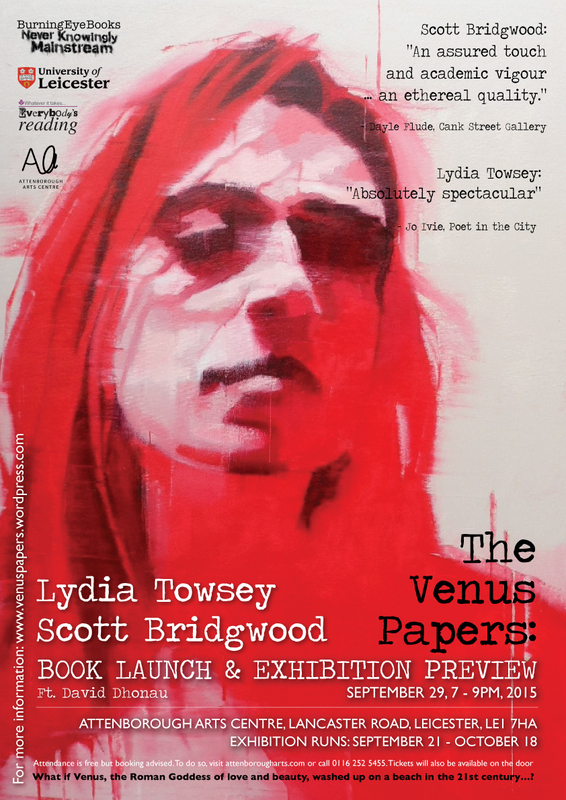 Thanks to Emma Lee for this lovely review of The Venus Papers’ launch event. Power and blessings to her elbows. Attenborough Centre, Leicester University, Lancaster Road Leicester 29 September 2015. Lydia Towsey is already well-known in Leicester as a spoken word artist, coordinator for Word!, Leicester’s spoken word evening, for being one of Three The Hard Way, lead of workshops in the NHS and tutor for Writing East Midlands. So it seemed an anomaly that a first collection seemed to be a long time coming. “The Venus Papers” falls into two sections, her poetry sequence “The Venus Papers”, looking at modern life through the eyes of a 15th century goddess who moves from innocence to experience, and the non-Venus poems which explore similar themes, looking at families, relationships and friendships with a wry wit and compassion. In picking poems to read at her launch, Lydia was spoilt for choice. Back in 2009, filmmaker Keith Allot made a film of me performing the below poem. Since then the piece has changed quite a lot – mainly in it’s performance but also in an alteration to its ending. The talented writer, activist and filmmaker, Ambrose Musiyiwa recently reposted the film on Facebook and fellow writer, Andrew Walton suggested it might be useful to see it on the page. 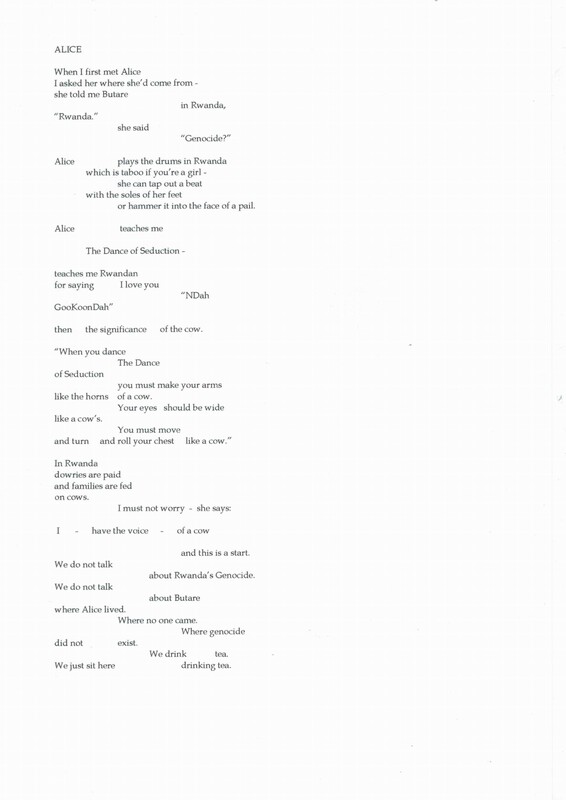 The poem will actually feature in my forthcoming collection, ‘The Venus Papers’ due for publication by Burning Eye Books in 2015 – but until then, here it is – with thanks to people for the interest.